We all love our gardens, and whether we’ve spent the summer sculpting the lawn with our new mower, or we work hard keeping those leaves away during the autumn and winter, we do it all with the intention of the garden being a more pleasant place to spend time. Unfortunately mother nature doesn’t share that point of view, and does whatever she pleases as far as the weather is concerned. This is a real shame of course as it means we’re always restricted on when we can use the garden, and are all too often kept indoors by the cold and wet outside. Luckily there are solutions to all these problems, and as far as maintaining a more comfortable temperature is concerned, we think the ideal solution has to be patio heaters. In much the same way as a traditional roaring open fire of fire would have warmed our ancestors, the modern equivalent does much the same, but with technology that keeps the cost of generating heat low, and of course, far more elegant looks. Gas patio heaters are essentially comprised of a burner which is either mounted on top of a post, or in some cases hung from a ceiling or mounted to a wall. Within the burner the flames are directed against a perforated metal screen that can be seen from the outside. On top of the burner there will usually be a reflecting hood (often an upside down dish shape) that reflects heat downwards whilst preventing it from being lost above. This type of heater typically uses a gas such as propane or butane as fuel which is stored in a gas bottle. It is possible to have a patio heater powered by natural gas, plumbed in straight from the mains, which is a great long term solution as you won’t ever have to worry about replacing depleted gas bottles. The disadvantage with this is that proper care and attention needs to be given to the installation of the heater, which should be carried out by a qualified gas engineer. 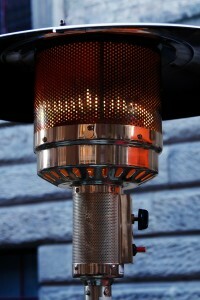 In either case have a good read through several natural gas outdoor heater reviews before you make a decision. Another type of patio heater uses electrical power to create infra-red energy to heat up the metal screen. This type of heater is less common here in the UK, as using a gas-powered heater here is more cost-effective. Having said that it’s far easier to get going with an electric model as it’s simply a case of plugging it into the mains, whereas a gas-powered heater requires the investment and hassle of purchasing gas bottles, not to mention the refills thereafter. As mentioned above there are various different sizes and shapes of patio heater available, so you shouldn’t have too much trouble finding one to suit your needs. Reading through outdoor propane heaters reviews you’ll notice many gas patio heaters are designed to be connected via a hose to the gas bottle that supplies them fuel. This arrangement works brilliantly but is less easy to manoeuvre around your patio or garden at short notice. If you know that you’re likely to want to do this then it would be better to invest in a portable heater that has a built-in compartment for holding the gas bottle. With electric patio heaters the only limit to portability is the length of the supplied mains cable, though clearly this can be resolved with the use of an extension lead if necessary. Common sense dictates that the more powerful the heater the larger the area that it will heat, however it’s worth bearing in mind that in almost every case you’ll need to be sat or stood fairly close to the heater for it to make an impact. It’s also worth pointing out that rather than being designed to make the whole area warm, patio heaters should be thought of as taking the chill out of the air and giving you something warm to focus on, in much the same way as a camp fire does. With gas-powered patio heaters the design of the heat reflecting hood is as important, if not more important than the power of the heater as its ability to reflect heat dictates how much heat you will feel. An effective reflecting hood is also more efficient than an electric heater with a fan, as there is no need for the expense of a secondary process. Clearly objects that heat up to red-hot temperatures are always going to have risks associated with them, and patio heaters are no different. To minimise the risk of injury to users, a good patio heater will have a tilt valve that automatically shuts off the heater if it tips over beyond the angle at which it’s likely to fall over. If your heart says gas but your head says electric, why not opt for this great electric halogen patio heater from Andrew James? It’s got all the presence and prowess of a traditional gas heater, and crucially it kicks out just as much heat. Best of all though, this can be used both indoors and out, and the centre table? Well, that’s just the icing on the cake. It might be discreet, but don’t let that fool you, this parasol heater kicks out a comforting warmth at all times of the year, all the while driven by the clean and hassle free force of electrical power. It’s lightweight and a doddle to install, but what’s particularly ingenious is it’s ability to fold down along the neck of the parasol when not in use. So when you close the parasol you can leave the heater in place, very handy. As easy to install and use as a parasol heater, but with a hint of the brushed steel classiness of larger standalone patio heaters, this electric heater is the ideal solution for bringing heat to semi permanent outdoor structures such as summer houses or gazebos. These spaces excel both practically and visually, and therefore demand a heater to match. This could well be that heater. If visual simplicity is your thing then this heater is great alternative to the traditionally unwieldy gas patio heater. Made from a rust proof aluminium, the casing to this heater won’t corrode any time soon, so you know you’ve got something hard-wearing that will serve you well in just about every scenario, from the summer-house to the pub garden. eater head can be angled to suit the ever-changing demands of those who use it. A great piece of kit with the only down side being that it probably doesn’t kick out enough heat to be used in the coldest days of winter. 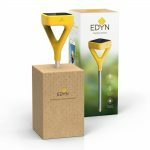 A small and convenient electric heater, this model rotates automatically, providing heat for those stood or seated nearby. Certainly not a heater to keep large groups of people warm, this is much better suited to the needs of a small relaxed group on a mild autumn evening. Maybe you’re an old romantic who loves alfresco dining for two, or maybe you always feel the chill more when you’re sat down. In both cases and more, a table top heater is a great solution. The small size makes portability and storage easy, and it looks great as a centre piece to any table, and which of course means you don’t need to think about mounting or positioning the heater, it’s pretty much self-explanatory as far as that goes! For a heater that ticks all the boxes as far as style is concerned then this is definitely the model to go for, with it’s pyrimidal contours it’s a striking piece, and a great option for weddings and other more formal occasions. As a gas powered beast, portability is also a massive strong point of this heater, whether at the end of the garden or on the patio, this takes care of both scenarios. Best of all the gas bottle is stored out of sight, hidden inside the heater’s casing. An ultra versatile parasol/umbrella heater, this is all about function over form. Like other parasol heaters this model is light weight and easy to install. The really stand out feature is in being able to adjust all four heating heads independently, making this heater totally versatile, able to accommodate a range of different tastes simultaneously.